Deciding where and how to invest in marketing is a task not to be taken lightly. You know you need to create exposure for your brand, and you know you need to do it in a way that attracts and persuades rather than alienates potential or existing customers. There is also the not-so-small-matter of retaining loyal customers and creating brand advocacy to consider. Taking your existing customers into account is a critical consideration as you begin and continue narrating your brand story. Email marketing is one of the most effective and efficient ways to both extend your reach and exposure as well as establish an effective communication channel with your existing clientele. To get the right results, however, it needs to be approached in the right way. Get it wrong, and the only thing you’ll be exposed to is the junk mail folder! In this post, we’ll cover the seven reasons why your company should be taking advantage of email marketing as a viable and fruitful marketing tool. All the smart marketers know that staying top of mind with their target audience is an extremely important goal when you are trying to retain and grow your customer base. Email marketing is a decidedly effective way to do this. By leveraging informative emails, personalized emails, seasonal emails, promotional emails, and feedback emails, you can address customers at every stage of their lifecycle. This frequent and relevant communication serves to keep your brand front and center in the minds of those who matter. Relevance is not just another buzzword; it is one of the most important elements of email marketing. Automation can help you to keep your emails in line with what your target audience wants and to personalize the experience for them as much as possible. BuzzFeed, for example, offers visitors a range of newsletter topics from which to choose. This level of customization ensures the emails they receive are always on their wavelength and always welcome. Email automation can also be an invaluable tool in nurturing leads into customers, encouraging customers to complete abandoned transactions, and in introducing highly relevant up-sell opportunities. Those of us who remember first using emails in the early 90s will appreciate the difference it made to our lives. Since its widespread use, email is still the number one form of digital communication. While it’s true that social media is more popular than ever, don’t conflate that with a decline in email. In fact, you are six times more likely to get a click-through from an email campaign than you are a tweet, and email is forty times more effective at acquiring new customers than Facebook or Twitter. Social media marketing is a great tool to have in your toolbox, but only 65% of adults online use social media while a whopping 92% of adults online use email. 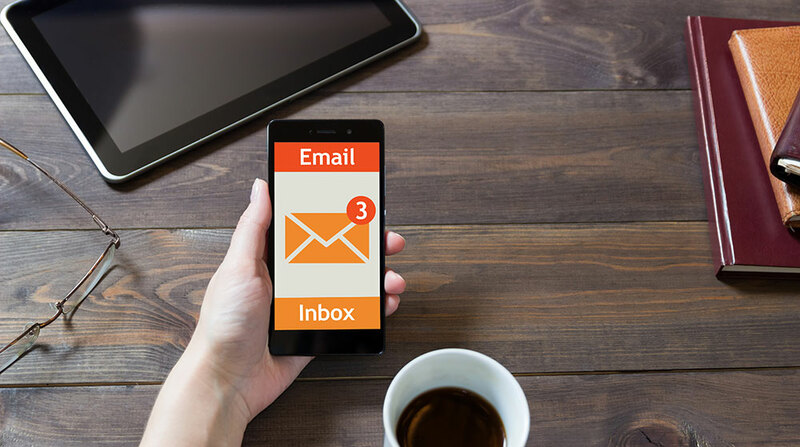 Many companies avoid using email because they believe it to be somewhat outdated compared to today’s social media and mobile marketing strategies. However, according to recent research, 59% of marketers said that email is still the most effective marketing channel. 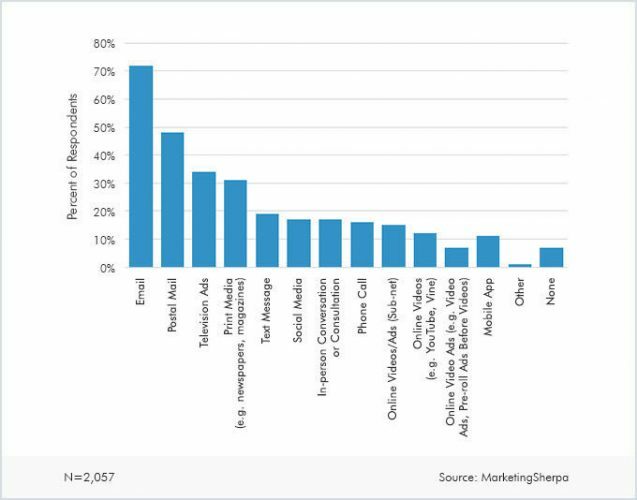 A recent report from Marketing Sherpa shows 72% of people prefer marketing messages to be delivered via email versus just 17% for social media. Marketing with the personal touch helps you to form meaningful and lasting relationships with your customers and leads. Unlike other marketing channels that can be limited in their targeting methods, email allows you to break your audience into logical segments. Segmenting your email marketing lists allows you to customize your email messages to suit the specific interests, preferences or needs of those different audiences. Bu using segmentation to send highly customized content you ensure your messages are as relevant as possible and are sent at the right time to create positive exposure for your brand. Whether you are launching a new campaign or retargeting customers, getting the most from your email marketing efforts is essential. There are many tools you can use to boost your email exposure, reach, and click-throughs. Even better news is that they are tools you are possibly already using. For example, your CRM data or the customer data on your e-commerce platform can be used to segment and target customers more effectively. By integrating these tools seamlessly (most platforms allow this) with your email marketing campaigns, you can set up automated emails that nurture customer relationships and move them further along the buying cycle. It’s time we addressed the elephant in the room and get down to the most compelling reason that you should be using email marketing – it works. Email marketing is one of the most effective forms of marketing you can use today, and the results are tangible. Research has shown that email still has the highest ROI of any other marketing medium, beating paid search, social media marketing, and TV and radio ads. In fact, according to Campaign Monitor, email marketing generates a staggering 430% return on investment and drives more conversions that search and social combined. If you execute it properly, email marketing is not spammy, it will not cause your customers to disengage, and isn’t exorbitantly expensive. On the contrary, well-executed email marketing campaigns are highly relevant and engaging, drive meaningful customer interactions, and are extremely cost effective. If you have tried and failed with your email marketing in the past, don’t give up, get better. Email marketing is not a one-size-fits-all solution. Most will try and fail at a few techniques until they fine tune their email marketing strategy. If you are unsure of how best you can utilize email marketing for your business, reach out to us and schedule a time to discuss what you are currently doing and what you’d like to accomplish with one of our marketing strategists.